Have you ever felt like being part of something epic when playing Forgotten Hope 2? Tired of playing the same old maps on random public servers without any real teamwork or coordination? You wish players would work together and coordinate with armor and air assets? You wish FH2 could be be played in a a whole new way - as an organized team? Today is your lucky day! 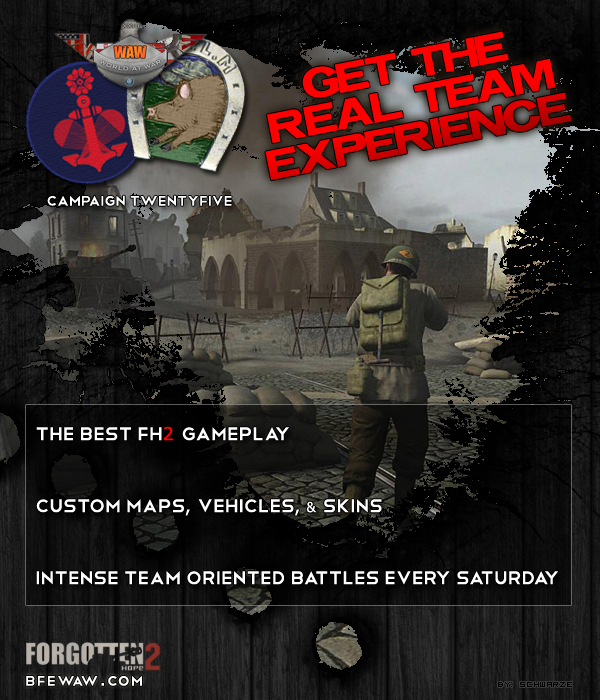 The World at War Tournament has just opened signups for its 25th campaign of organized, coordinated and teamwork based FH2 combat. Sign up to the Japanese 69th Combined Special Naval Landing Force or the French 70e Division Légère Mécanisée and become part of a real team with players from across the world who love teamwork, just like you. Fight and train alongside your buddies every week using TeamSpeak 3, custom WaW maps, equipment and gameplay features such as great naval combat, new aircraft, weapons, vehicles, and many different custom maps. Why should you join WaW Campaign 25? Epic 64-player 9-hour battles every Saturday. Fight when you want, for as long or as little as you want. It's completely free and it's a lot of fun! You're gaming experience will never be the same again after playing FH2 with real teamwork and coordination. The World at War Tournament has been providing some of the best organized gameplay on the battlefield platform for almost 10 years with a mixed community from across the globe. Friendly and welcoming, our members make it easy to integrate into a team without the obligations of a clan. Experience camaraderie seldom found in online gaming and an atmosphere that will keep you coming back for more! We had an excellent battle this week, even though the score was 10-3 most of the rounds were very close and hard fought. We had an Awesome battle Saturday. Two of the rounds back to back finished 6-0 then 0-5. Cannot get much closer than that. The squad discipline is great and each week we have had a great battle. I have been at WAW since Campaign 12 and we are now on Campaign 25. We have been through a lot of changes but WAW is an awesome tournament and FH2 is still a great mod! WaW! I came for the competition and stayed for the people. Really a great community and a great tournament, I definitely recommend checking it out even for just one battle. You can't find this type of gameplay and organization on a pubby server, it changed my whole FH2 experience. My name is Paasky and I approve this message. * Paid for by the Society for the Betterment of Tapirs. If you guys want some good fun Tournament style WaW is your place. Also during the weeks we do have practices and such for each division and between those days we just have fun and play other different games to keep us busy. WaW is very fun, instead of pubby play only this is a very big positive difference. Teamplay is the major fun factor of WaW, and new maps and weapons is very fun also. I really look forward to next battle and i don't regret at all signing up for it. I joined WaW back in FH 0.6, and have been participating there in some form or another for the last.. something like 6 or 7 years. It really is a whole new way to play FH, and very, very hard to go back to pub and expect the same level of teamwork or excitement, or in my case, opportunity to score whore as much as possible. There is nothing in 99% of pub play like shooting full 4 man jeeps on a regular basis, or defending a flag with 5 squadmates against 2 full incoming squads, or having dedicated spotters while you tank and working with the rest of the armor on the map. Michael Wittmann's gunner, Bobby Woll, was known to be an excellent Marksman. He could hit targets at range even on the move. It started for me with just a test and also a break from another tournement in 2008, BFE:CoD, but in the end it was much more fun, bigger maps, more players, intense fighting with Armor, infantry and Air. So i decided to stay and I've been in WaW ever since campaign 17. I've been playing at WaW since campaign #4, although with a few time offs for good measure. I've done almost everything there is to be done in the tournament, minus taking the General spot (thank God!). Although it isn't a perfect community, it is perhaps the best one in terms of camaraderie, team play, fun and friendship. No mater the length of the time out, I always get back in. Try it guys and gals, you won't regret it. Some of my greatest gaming experiences are from playing in the WaW tournament and playing with a lot of the guys (and gals ) there! Definitely a great community of players! Also can't forget the amount of custom content: maps, vehicles, weapons, and NAVAL BATTLES! I don't have bad things to say about World at War. This is a tournament that I stumbled upon and have played for many years with much satisfaction. A tourney, yes. But, it is filled with great, awesome gamers that quickly become long lasting friends. In a sense, it's a tourney that turns into an extended family. I've had the pleasure of filling nearly all ranks within, and each one gives you a sense of pride. WaW is a community that offers so much. You will learn great tactics, learn new skills, play on custom maps, weapons, vehicles, and equipment, gain friends and true camaraderie, be challenged, and above all else, have a ton of fun. Public play will never be the same; never amount to the same experience. There is nothing like charging with your buddies for an enemy flag, watching each others' backs, and capturing your objective. But, WaW has much more to offer than FH2 gameplay. It is a resource for new games, for how to build a computer, for how to fix issues, for seeing the next funniest thing on youtube. It is a community that extends deeper than mere gameplay; it is a community that brings so much to the table. Check it out, join up, be your own judge and see what you will find special in this community, for everyone is unique!!! We will be here ready to welcome you. I've been playing in WaW for a few years and for me it seems to get better all the time. A big part of that is the life extension provided by the custom maps and the additional weapons, vehicles, and other equipment. FH2 is a great game, and the WaW Mod extends that further. The WaW Mod is benign; your standard BF2/FH2 installation is not affected. There is no Battle this Saturday, (due to a Holiday), but if you're interested get signed-up today and start planning for the next battle the following Saturday. Get in a Division and then pick which Company you want to be in. Get into the team spirit and enjoy this great game.